Welcome to our healing dome. Our Dome is a Nakshatra Thiruvonam, this specific wave lengths supports healing and the ultimate attainment of maximum benefits of balanced health, as long as one also lives in balance with spirit and nature. To be open in heart and mind and to “let go” into the natural flow of life will support one to discover the maximum benefits of this powerful energy wave length. Here are some of the activities that take place inside the dome: Aerial Yoga, Yoga, Meditation, Chanting and fitness clases. If you are a guest we invite you to spend time in the Dome with yourself and surrounded by nature. These are the moments in life that make it so special. Enjoy! Many healers use the dome because they believe that geometry helps reorganize the cells of the body and hence improve health and creativity. 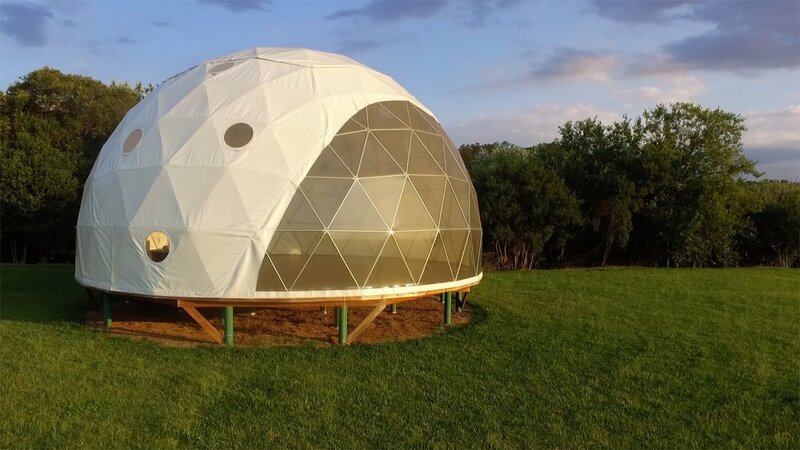 Another advantage to the dome is that it can be used to remove stray electromagnetic waves by grounding the metal structure into the earth. Many meditators use the domes to enhance their practice with great success. Similarly, because of these spherical coordinates the acoustics inside the dome are phenomenal and exquisite. Chanting at the point of singularity in the center of the dome generates the effect of hearing yourself from within.